The Crescent City. The Big Easy. The City That Care Forgot. NOLA. No matter what you call it, these names all mean the same thing . . . You are now in New Orleans! I've always wanted to see the Crescent City and I finally had an opportunity in November when I met my husband (who was there for a work conference) for a much needed getaway and the hopes of taking a few (or 800) pictures. I arrived the day after Halloween and, may I say, there were still people (adult people) trying to make it home from Trick Or Treating. :) If you've never been, get ready for sights, history, amazing food and plenty of jazz. Our first night, dinner included pumpkin bisque soup, shrimp and grits, and was finished off with bread pudding. Beignets for lunch one day; a Po-Boy sandwich the next - thank goodness we walked 7-9 miles each day! Whether it's day or night, expect to hear jazz music pouring onto the streets - either from talented street performers or one of the many jazz clubs along Frenchman Street. Take a walk down Bourbon street (during the day) just to say you've been there, but then head over to Frenchman Street in the evening for great NOLA cuisine and jazz music that will delight your ears for hours. If New Orleans is not on your bucket list, it should be! It's an experience that you don't want to miss. I hope you enjoy these images and a few of the sights from New Orleans. With things being a bit "unsettled" in London and Paris earlier this summer, we cancelled our family trip there at the last minute and scrambled to find an alternate destination. After looking online for ideas, my husband came to me one night with the prospect of taking a four-day cruise to Havana, Cuba. Some might argue that this is hardly the substitute for London and Paris, BUT, when we presented the idea to our kids (17 and 12), they were ecstatic! It would be an opportunity to explore a new land - at least for Americans who have not been permitted to travel to Cuba for over a half a century. It's a country that has stood still in time and, while the boarder was still open, we could not resist. And, fellow Americans, go now, if you've been considering it! You will not be disappointed! Travel to Cuba is still restricted for Americans and one of the few travel options is by ship along with documented travel plans. We left the coast of Miami, Florida on a Monday afternoon on the Norwegian Sky and pulled into the Havana Harbor at sunrise the next day. I climbed out of my small twin bed in the cabin my daughter and I were sharing and went anxiously to our porthole window to peer out. I felt like a kid checking to see, if Santa had come. I could not wait to have my first look at Cuba. Eclectic architecture, vintage cars, vibrant colors, Cuban music and fedoras for sale - it was everything I had imagined! The excitement in the Cuban people for new visitors to their shores was evident and they welcomed us with open arms; new American tourism gives them hope for a prosperous future. They expressed tremendous pride in their country and its people who have endured much over the last several decades, but are now showing signs of progress. The economic hardships in Cuba were startling in some parts of the city - half of a building condemned while the other half still occupied with freshly, washed clothes hanging on clotheslines. In the large squares of Old Havana, however, there was work being done on every corner to restore and revitalize this historical city; bringing back the beauty that was once Havana. Although our time in Havana was short, it was plenty of time to fall in love with this amazing country full of wonder, culture and history. It left me wanting to know more about its history and its struggles AND it definitely left me with a desire to return again soon. I hope you enjoy these images from our short stay in Havana! Please leave a comment, so I know you visited. Thanks! When we booked our trip to Quebec, Canada, we were hoping for a little feel of Europe. And, it did not disappoint! We had cancelled a trip to London and Paris at the last minute, but still wanted to give the kids the experience of cobblestone roads, bakeries, french cuisine and a chance to use a little bit of French. We found all of that in Quebec - plus some! We had about four days to spend in Canada and spent the majority of our time in Old Quebec City which is a gorgeous French Canadian city full of charm (and a lot hillier than I thought, reminding me of San Francisco!). We began our stay by strolling through the lovely cobblestone streets that were alive with French Canadians, live music, and the smell of maple popcorn (it's amazing!). It was the beginning of a weekend-long celebration of Saint Jean Baptiste Day in Canada and there was excitement in the air. Each day, when we set out into the city, we came across new streets to explore that were just as stunningly beautiful as the last. By chance, we came across one of the best french restaurants in Old Quebec City called Les Anciens Canadiens on Rue Saint Louis. If you ever make it there, I would highly recommend it! The "Old Country" feel of Quebec City was just what we were looking for, but we also had a chance to enjoy Canada's gorgeous landscape at the Montmorency Falls (where my husband and daughter zip lined over the falls!) and a countryside drive on our way to Montreal. 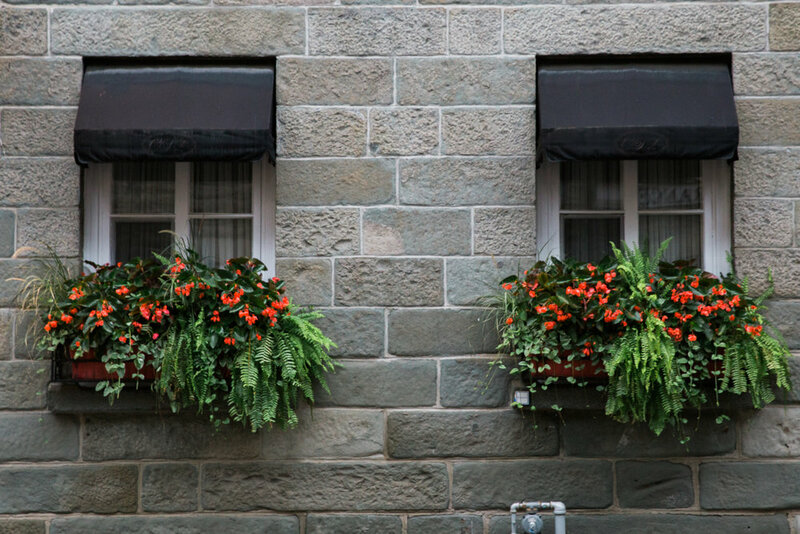 We ended our trip with a stroll through Old Montreal where window boxes overflowed with beautiful, summer flowers. The kids were mesmerized by street performers and we feasted on french crepes filled with Nutella and fruit (I was the only oddball and picked lemon - yum!). Below are images I captured on our Quebec vacation and I hope you enjoy them. And, of course, if there is one you just cannot live without, they are for sale. :) Just message me for sizes and prices. Nicaragua Bound! Finishing what we started. Last September, I had an opportunity to travel to a part of the world I had never seen before - Nicaragua. With a small team of five, we made our way through the beautiful mountainside visiting communities and offering clean water options for the families who lived there. You would think that most people would jump at the chance to have clean water, but it's not quite that simple. Most do not realize that the illnesses experienced by their children and elderly are being caused by contaminants and parasites that exist in the water they use every day for drinking and cooking. And, to think we met with these people a year ago and we are just now returning is hard to believe, too, but there are so many things that have to be considered. We have worked around poor weather, coffee harvest season, volunteer schedules, country elections (which can cause a little unrest) and also communication. It is not easy to coordinate something like this when no one has email or phones. To give you a little background on our visit last September, we identified two communities that were good prospects for a water purification system. The first town welcomed us in like we were royalty - music, poems, dances. They were so happy we had come to bring clean water to their community! After a discussion with community leaders, however, we found that not only did they need CLEAN water, but they just needed WATER . . . PERIOD! Thousands of people were living in a town with no water source - at all. And, a water purification system is useless without water. Needless to say, they were devastated and so were we. After such a warm, exciting welcome, we felt completely defeated. With our hearts heavy, we left that day promising to continue to look into other options for their community, but, so far, no solution has been found. The next community we visited, however, was a go - citizens were willing to take the necessary steps to bring clean water to their community AND there was a natural water supply close by. Next week, we'll return to this small town near Matagalpa to finally see this project through. Our more mechanically inclined team members (definitely not me!) will install the system while I work with two other team members to teach the adults and children proper hygiene and how/when to use their new, clean water. Lots of fun things on my shopping list this week for our group activities like glitter, Play-Doh, beach balls and Oreos! At the end of the week, we will join the community in a celebration and all share a glass of fresh, clean, safe water together. To see this project through from start to finish and bring hope of a healthier future is a amazing feeling. My bags are packed (two backpacks) and I am ready for a week in Central America (not thrilled that it's the rainy season, but ready!). It's extremely hard leaving my kids and husband behind next week having them depend on grandparents, neighbors and friends to get them through, but I feel so blessed to have this opportunity. When I hear complaints from the kids, I just remind them that these people cannot live without clean water . . . and I'll be back before they know it. Here are a few images from last year's trip. I cannot wait to share new images with you when I return of lush, green coffee fields and gorgeous brown-eyes and big smiles. Hi, All!! I am so swamped right now with an upcoming show this weekend and a trip to Nicaragua next weekend, but I just had to show off this new collaboration that was just born! This summer, I had an idea during one of my events to find someone locally who could build beautiful, distressed, wooden picture frames that would compliment my photography. Our family travels to a lot of coastal destinations, so many of my photos are of beaches, boats, buoys, etc. and I thought this style picture frame would work perfectly - especially for my upcoming shows and new shop in 3 Little Black Birds in Chesapeake (I'll be there starting in November!). I will have my photography on display this weekend (9/17 from 10-3) and also on October 15th at 3 Little Black Bird's Backyard Bazaar. Then, I'll move into their store with a permanent location in November. So excited about this! Here is a look at the work that went into these gorgeous, on-of-a-kind frames with photos courtesy of Vanessa. If you are interested in placing on order for frames, just send me a quick email and I'll get you in touch with Vanessa Hurlburt. If you are looking for my prints, they can be ordered directly on my website. Thanks for stopping by! Wish us luck! Images from the 911 Memorial and Museum in New York. Numerous times, I've visited the Trinity Church near Wall Street that survived the 9/11 attack. In the days and weeks after the attack, the church served as a triage and restitute for rescue workers and then later became a temporary memorial and museum for thousands to visit and remember the most horrific day in U.S. history. Last fall, my husband and I were able to tour the new 911 Memorial and Museum in New York. The stories that survived September 11, 2001 and that live on today are ones of courage, love, loss and heartache. It is indeed an emotional walk through the happenings of that day. One of the most memorable aspects of the museum, however, for both Jay and I was the escalator ride back to the main floor at the end of our tour. As we left ground zero and road the escalator quietly up to the next level, the beautiful sounds of bagpipes began softly playing "Amazing Grace". Our heavy hearts were suddenly lifted. Once all of my props were ready, I could not wait to get started with these precious back-to-school mini shoots! My first shoot was on one of the hottest days of the week with the thermometer sitting right at 100 degrees. I found a nice spot in our backyard under the trees (so it wouldn't feel like 110) and lit a few citronella candles to keep the mosquitos away (we live on the water and deal with those things even in daylight). From now until September 23rd, I'll be doing mini-sessions just like this one on Thursday and Friday afternoons from 3-6. Shoot me an email to schedule your appointment! Preschool, kindergarten, First, Second . . . they are only this little once. I would love to capture this time in their lives for you. When I said, "yes" to doing a fall preschool photoshoot, my mind immediately went to images of sweet, smiling faces, red apples and a vintage school desk (the same desks we used in school which makes me really old). After calling a few vintage rental stores in the area in search of a school desk to rent, I decided it would probably not be too hard to find someone willing to sell one. In just a few hours, I had found one for 20 bucks through a Facebook contact. Sold! Before you judge my skills, I have never refinished, repurposed, refurbished or any other "re" when it comes to furniture. But, how hard could it be? Any imperfections would just add character (you'll see some "character" in the images). So, I took this wonderful, extremely brown desk (photo below taken by the seller - cats not included) and began the process of turning it into something photo worthy. For those of you who have done simple projects like this, you'll notice right away that I proceeded doing everything out of order (I spray painted the metal which meant having to protect it while I removed the stain which meant I lost some of my paint, because I'm a beginner and so on). BUT, remember I'm adding character to the desk, so it's all good! Almost ready to add props! With the desk taken care of, I was still in need of some great vintage books. My lovely sister-in-law had given me a great set of uncovered books that I was really excited about using. I decided to add a few classic titles to the scene, too. I started shopping on Etsy (love Etsy!) and I found a great set of classic Bobbsey Twin books as well as a set that included Peter Rabbit, Stewart Little and Charlotte's Web. Too cute to pass up! I used these three books in a basket (TJ Maxx) and put the Bobbsey Twin set in the inside of the desk to add detail. With a small globe from TJ Maxx and mason jar full of pencils, I was ready for my first client! The stain on the desk dried on Wednesday and I was ready for my first photoshoot on Friday - that's a quick return on investment! Eliza (6) and her sister Alaina (4) were my first clients and these sweet girls were absolutely adorable! The images turned out exactly as I had hoped and I can't wait to share them with you! Stay tuned for my next post and this precious Back-to-school photoshoot!